Valthume is an ancient barrow where ancient knowledge awaits and the restless dead still battle. It is located southeast of Markarth, and southwest of Rorikstead. Upon entering there is a ghostly figure named Valdar, who immediately greets you and explains that evil is lurking in this barrow and ask you to help him (see the relevant quest for details). There is a throne that is bathed in natural sunlight from a grating above, with his skeleton still sitting where he has been keeping the evil trapped. Next to the throne is an ancient Nord helmet. Once you have agreed to help he will instruct you on what is required and lower a hidden door at the rear of the room. The hidden door reveals a tunnel with thin cobwebs along it that leads to an ornate double door that opens into Valthume itself. The area is filled with urns, burial urns and other containers filled with minor loot and empty coffins. The first room you enter is huge with a sarcophagus in the center of the room with stone carving at each corner, various stone pillars support the massive ceiling and lit braziers providing light. Beyond the sarcophagus, at the rear of the room is a throne on a raised platform with lit torches on either side. Behind the throne to the left is a caved-in area with a dead draugr and to the right is a doorway that leads into a narrow corridor with a pressure plate that triggers a battering ram in the next corridor, this can be used to kill or injure the first living draugr that is standing waiting in this corridor. The corridor heading south opens into a small room with a second draugr. In this room there are a couple of sideboards that don't hold anything of interest, a stone table coming out from the west wall with a draugr on top. Against the south wall is a set of shelves holding two bowls of troll fat, two skeever tails, two bowls of bone meal and a sack of foodstuffs beside it. There are two exits from this room one to the left of the shelves to the south and the other in the southeast corner, heading east. There is also a doorway in the northeastern corner, but that way has caved-in, you can however peer through a gap and see deeper into the barrow. The doorway to the south descends a flight of stairs to a wooden door, unfortunately it is barred from the other side. Taking the doorway heading east descend a flight of stairs and then opens onto a balcony above a room, with another balcony opposite that has a ghostly figure that drifts away out of sight. 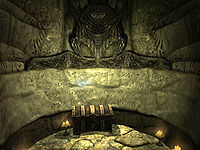 Below the room has several rows of benches facing an altar with a throne on either side in the corners, there are draugr sitting in these thrones, the one on the left will be leveled. Behind the benches is a trapdoor and there are stairs leading down from the balcony you are on. It is also possible to jump from the balcony to wooden planking along the north wall and then at the end use whirlwind sprint shout to reach the other balcony where the ghostly figure was, behind this is a short corridor that leads to a random shield and an unlocked chest. Descending the stairs and approaching the altar will cause both draugr in the corners to rise and attack. On the altar is a dead draugr and in front of it is an unlocked chest. There are three exits from this room, dropping into the room beneath the trapdoor, and doorways to the north and south. The one heading north is the route back from beneath the trapdoor, while the doorway to the south leads farther into the barrow. The room beneath the trapdoor holds an iron sword and a banded iron shield, with an iron door that opens into a frostbite spider lair containing up to four frostbite spiders and an egg sac that can be harvested for a spider egg. Just on the other side of this iron door and slightly to the right, there is a gold diamond ring lying on the floor by the hand of a skeleton. It is not always easily visible, so scan the floor carefully. To the northeast just past a pair of unharvestable egg sacs is a draugr standing slumbering against the wall, hidden behind webbing; it will be carrying the Valthume Cellar key and will be a magic user. Opposite where it is standing is an iron door with an expert-level lock, that is opened using the key carried by the draugr. Behind the door is a stairwell with a wooden spiral staircase leading up. here are two growths of bleeding crown fungi at the bottom. At the top of the stairs is the room to the north of the room with the trapdoor. It contains a couple of sets of shelves, one of which holds a plate with two amethysts and a flawless emerald. The corridor heading south has a row of oil lanterns hanging from the ceiling. There is a doorway into a room partway along it. This room also has several oil lanterns hanging from the ceiling and contains a stone table against the north wall, with a woodcutters axe and an iron mace on top and a knapsack underneath. A broken table to the west holds a leather strip, with an open door to the left of it leading to another small room. In this room there is a stone table and bench opposite with a copy of the Restoration skill book Withershins on top and a sideboard holding three potatoes and a leather strip to the left. In the main room, against the south wall is a sideboard holding a leather strip, two sheaves of wheat and a snow bear pelt, with a set of shelves to the left holding another snow bear pelt, a bear pelt and on the floor in front is a wolf pelt. The corridor continues past the room and end at an unlocked iron door. Behind the door is a room with more oil lanterns above and an oil slick on the floor, there are two skeever and a draugr in this room, setting fire to the oil slick should take care of them. When you enter the room you should see the ghostly figure through a window to the south. There are several pressure plates that trigger some feeble poison dart traps, that don't seem to fire more than one or two darts. At the end of the room there is a gated corridor to the west and a concealed door to the east, the handle to open it is to the left of the door. This open to reveal a tunnel that leads to a naturally lit room with an upright sarcophagus opposite and the first of the opaque vessels required on a pedestal to the left. The sarcophagus will burst to reveal a leveled draugr. In the northeast corner is a growth of blisterwort fungi. Also in the same room, if you were to turn immediately left after entering the room with the sarcophagus, you will find a half-buried skeleton with a iron dagger and a silver ruby ring. Returning to the gated corridor to the west in the previous room, lifting the opaque vessel has lifted the gate allowing further exploration. After a few pace the corridor turns to the south and opens into a larger corridor with roots crisscrossing the floor. 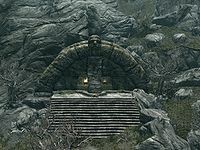 Upon reaching a carved face that has fallen to the floor the corridor staggers to the left and opens into a large room, you are on a balcony area, with a couple of stone tables in front of you, a bridge behind them leads over to another small area with a magic using draugr guarding an adept-locked iron door and a ramp descending to the floor of the room. The tables have three potions of regeneration, two bunches of tundra cotton, a baked potato and several wheels of cheese on top. The adept-locked door opens into a large room with a sideboard holding a bulb of garlic next to an unlocked chest against the west wall. In the southwestern corner is a bookcase holding eleven common books, a random stamina potion and a random strength potion. There is a throne in the middle of the south wall with a table in front of it. On the table there are two potions of regeneration, a random strength potion, a random magicka potions and a random health potion. There is a second bookcase at the eastern end of the room holding a flute, a drum, a bowl of bone meal, several more common books on and around it, and a potion of health on the floor in front of it. There are two more draugr below you, the first is leveled and is patrolling from the bottom of the ramp to the other end of the room and back again. There are several broken skeletons around this lower level. In the southeastern corner of the room on a raised section is another draugr standing next to a stone table with a skeleton on top and two more unfortunates shackled to the wall and various torture equipment around. There is an exit to the east and another to the north over another raised section. The room to the north has a couple of sets of shelves and a concealed door to the east, the handle to open it is to the left again. The tunnel behind twists and turns until it reaches a room with a stone table with a dead draugr in front of you, an alchemy lab on your immediate left, with a sideboard to the right holding three random potions, one healing, one magicka and one stamina. Above this is a rack holding a garlic braid, two bunches of dried elves ear and a bunch of dried frost mirriam. Against the west wall is a sideboard with an unlocked chest on top. To the north is a window out into the room previously traversed with the two skeevers. Back in the main chamber, the door to the east leads to Valthume Catacombs. Entering the catacombs leads directly onto stairs leading down to the north, at the bottom the corridor turns east and opens into a room with a trapped chest in front of you that opens a trapdoor in the ceiling, releasing a giant frostbite spider from above. There are two smaller additional frostbite spiders in alcoves to the sides of the room and stairs on either side of the chest leading down to the floor. Underneath the chest, behind thick webbing that has to be cut or burnt though is a skeleton and opposite at the bottom of stairs between two statues is an altar with another skeleton on top. There are two egg sacs that can be harvested in this room, one in the southwest corner and the other at the top of the stairs in the northeast corner. There is a gated doorway in the middle of the east wall with the chain to open it on the right. As you enter the catacombs proper, there is a draugr standing slumbering in an alcove in front of you. The path turns to the north and then back to the east. Take care as there is a draugr patrolling up and down this corridor and a pressure plate at this end triggers a swinging blade trap ahead. After the trapped section the path turns south and then east again and enters a brightly lit room with an altar holding another dead draugr. The path continues to the south, with another slumbering draugr in an alcove at the far end. Here the path turns to the west, with yet another draugr ahead and turning north there is another in an alcove on your left. To the west there is a gated doorway with a chain in an alcove on the right wall, between stacks of coffins. There is also a narrow corridor to the south. 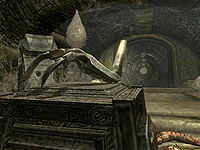 Beyond the gated doorway is a room guarded by a leveled draugr containing numerous sarcophagi, all of which are inactive, the second opaque vessel and a row of three spellcaster traps, that only shoot through the windows into the next corridor, so you are safe to remove the soul gems from this side. This makes the next corridor that much simpler and safer. Backtracking and taking the corridor to the south, it turns to the west after a few feet and enters a corridor with three windows into the previous room, where the spellcaster traps would have shot flames at you. At the far end there is a doorway to the south entering a room before turning east and descending past rows of alcoves for the dead, at the next corner it turns back to the south, ahead there is an altar with a dead draugr laying on top. To the west of here are two draugr wandering and two slumbering in alcoves, one along the north wall and the other at the far end along the west wall, many of these are leveled. In the southern half of the room is a pressure plate that triggers a spike wall that is hinged on the left. At the far end there is another gated doorway in the southwestern corner, with the chain to open it on the west wall. Through the doorway, there are sets of shelves on either side of you, but the only item of interest is a canis root sample on the top shelf to the right, next to a burial urn. There are wooden walls separating a central corridor from the sides of the room, with a small gap to the east by stairs leading down to the lower level, and another gap farther along by a bridge to an outer balcony, which houses an unlocked chest. The balcony and the floor below have many sarcophagi, but only a few contain slumbering draugr that will burst out. There is also one draugr patrolling the eastern balcony. From the lower level head west, passing into a rubble- and root-choked corridor. After a few paces, the corridor staggers to the left and ends at an iron door. Beyond the door is a corridor guarded by three frostbite spider and containing the iron dragon claw. Taking this from the pedestal will trigger the four flamethrower Statues around it, so be careful when taking it. At the far end of the room is the puzzle door, the solution, which is written on the underside of the claw is Dragon—Hawk—Wolf. Past the door are stairs leading up to a doorway, this leads into another room with a total of four draugr, most if not all can be deathlords, so be prepared for a tough battle. In the center of this room is the third pedestal holding the last of the opaque vessels, behind is a row of spears blocking access to the word wall and boss leveled chest. If you have been sent here to retrieve anything it will be in this chest. Taking the third vessel should lower the spear; if not, see notes or bugs. The word wall teaches part of the Aura Whisper shout. To the north of the word wall is a path to a gated doorway, the chain to open this is on the north wall. Follow the corridor beyond this doorway, passing through an iron door, and continuing until you reach the barred door you found early in the barrow, only this time you are on the same side as the bar and can raise it to provide a shortcut back to near the entrance. This provides easy access to the entrance once you've dealt with Hevnoraak. Don't forget to loot his ash pile for the mask and his unique staff. If this does not work, you can try moving on without it to Valthume, then coming back. The game will check for the existence of the vessel and retract the bars if it is not there. Be careful, as moving to different zones autosaves and you could end up overwriting the autosave that otherwise might've made this easier. Alternately, you can get the word without raising the gate by standing by the wall to the right of the word wall (the side with the door to the next chamber) and pressing yourself as close to the wall as possible. The word will go through the wall to you. If that doesn't work, try closing the gate on the right which leads to Valthume; activating the chain should do the trick. If you have picked up all three vessels and the bars have not retracted, stand on the podium for a few seconds and then jump off and then the bars will retract. It may be blown away to where you can't find it. You can try jumping on the pedestal or placing an item on it and the bars may retract. It may press the switch twice. If you are outside of the gate, you can jump on the pedestal and your weight may cause the bars to retract. If you are inside the gate, then you can try using a shout such as Unrelenting Force or Fire Breath on the pedestal; however, you may have to reload. Reloading the auto-save from when you entered the Catacombs, then exiting, re-entering, and making your way back to the door will correct this. This page was last modified on 16 April 2019, at 20:37.